There’s nothing tastes better than grilled food. Grilling adds smokiness, crispy coating, and a juicy center to any food, be it fish, meat or vegetables. That said, what doesn’t taste great is the leftover burnt residue from last week’s lunch. When you own a grill, it’s essential that you equip yourself with the best grill cleaning tools out there. Old, burnt crumbs and grease can make your freshly grilled food taste awful. Not to mention the health hazard they present. Did you know that the black leftovers on your grill could contain carcinogens? Why risk putting yourself, your family or your guests at risk of cancer (source)? Needless to say, if you have the best grill cleaning tools to hand, you’ll be sure to give your grill a quick scrub before and after you’ve used it. This article doesn’t discuss specific cleaning products—but feel free to check out our recommendations for those here. Let’s talk about the wide range of gadgets and tools that are available to help keep your grill clean. The most important thing is that the tool removes the food residue from the grates, but without causing damage. Another thing to look for is durability. Grill cleaning tools can wear pretty quickly if they aren’t made from strong materials. Unfortunately, another health hazard is ingesting pieces that have broken off from your grill cleaning tool. It’s estimated that between the years 2002 and 2014, around 1,700 Americans went to the emergency room due to ingested wire bristles. One in four of these got so sick they were admitted to the hospital (source). So, you want to select tools that are strong and durable and will also not leave broken pieces on your grates to potentially contaminate your food. Here are some of the most commonly available different types of tools available. 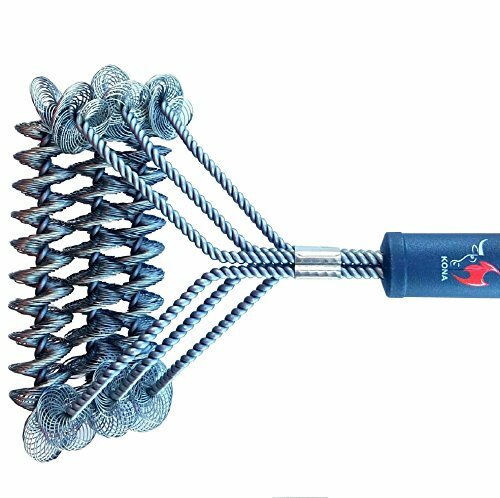 A grill brush is one of the best and favorite tools among BBQ owners. However, make sure to look for those that are either extremely high quality or bristle-free. Otherwise, you could end up with steel in your steak. Another useful feature to look for is a long handle. 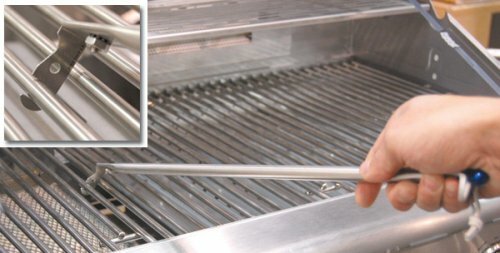 If the handle is too short while you’re cleaning a hot grill, you could burn your hands. Note: You can take a look at our dedicated guide for more info on the best grill brushes. Grill scrapers are usually made from wood, generally oak. When buying a wooden scraper, be aware that they need time to customize to the grates, with their shape changing during the first few uses to perfectly fit to the spacing in your grates. One of the benefits of a wooden grill scraper is you can easily turn it on its side and scrape the gunk between the grates, making for a more efficient clean. Similar to the wooden scraper, the stone will adjust to the grates the more you use it. A grill stone will wear down as through use, so there will be no waste. You might worry it could be difficult to clean hot grates since your hands are going to be close. However, you can find cleaning stones with a long handle, similar to a brush. Armed with the above information, we’ve made a list of some of the best grill cleaning tools we could find. These are all heavy duty, ready to get the gunk off your grates without too much hassle, all the while ensuring that you won’t have to worry about accidentally eating steel wire. On many occasions, getting the grill cleaned and ready for the next meal is a top priority. Having a brush that can get the job done in less time is always a huge plus. That’s why this brush from Kona really caught my attention. 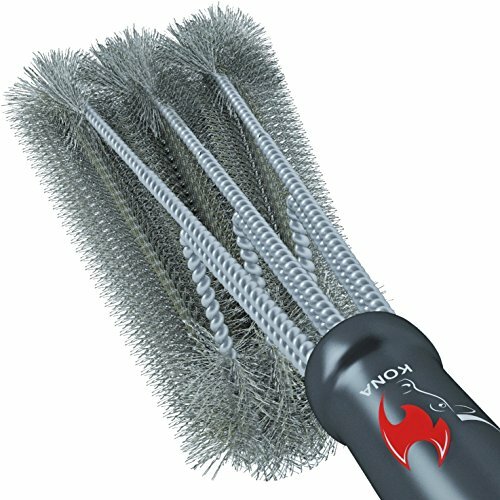 It features three bristle-free brushes in one, all made from hard-wired steel. The triple brushes are excellent for cutting through stubborn grease and burnt residue. The brush is ready for heavy-duty work. According to the manufacturer, it’s 125 percent more rigid than other similar brushes and will, therefore, last longer. Yet, you can still use it on various types of surfaces and all models or types of grills. Another great feature is the handle. It’s long enough to keep your hands away from the heat so you won’t have to worry about burns. I think that the absolute best thing about this brush is the fact that there are no bristles. Kona recommends that you dip it in water and use it on a hot grill. As you begin to scrub the hot grates, you’re creating steam, giving you a more efficient clean. Give it some turns on the grill before dipping it in the water again. After use, clean the brush and leave it to dry before putting it away. This will help you to avoid any rusting. Hard steel wires and no bristles. The 18-inch handle is a generous length. Triple brushes are full-sized, covering a large area of the grates at once. It can be tricky to get into the corners of the grates. If you’re looking for a bristle-free brush, this one from Kona would be the ideal choice. It might take one or two uses for the hard-steel wires to soften up a bit, but after that, your grates will be clean and safe. If you think this is the one for you, you can read more about it here. Bristles have always been a favorite. They’re able to get down in between the grates to dig all of the burnt pieces out. But to avoid having to add “bristles” to your menu, it’s essential to buy one made from durable material. The Kona 360° is extremely popular, and for very good reason. Similar to the Kona bristle-free brush above, this one also features three brushes in one. It will penetrate the layers of burnt grease until it reaches the surface of the grates. Although heavy duty, it’s suitable for many different surfaces. You won’t have to worry about damaging your grill. One amazing feature is the wide brushes, which allow for a faster clean. 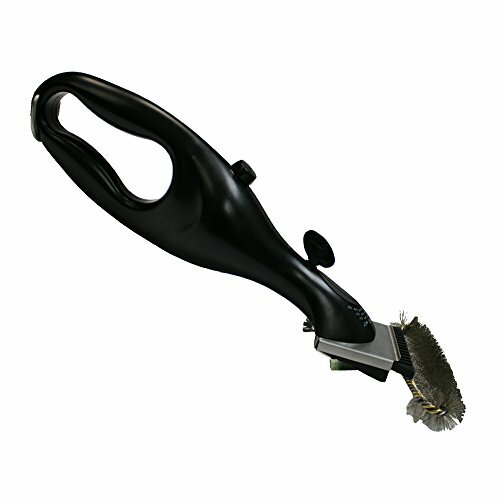 The unique design of the brush enables you to clean every side of the grates at once. That’s because the bristles face in different directions as opposed to all facing one way. The 18-inch handle will also allow for safe cleaning while the grill is still hot. For the unyielding grease, you can place one hand further down on the brush for extra pressure. But remember to wear a glove if the grill is too hot. The Kona 360 is extremely lightweight, yet tough enough to get the stubborn gunk from last month’s cookout. You can use it on hot or cold grates. Like the Kona brush above, it’s recommended that you dip it in a water bath and then brush the grates while they’re hot. You can also fill a spray bottle with water and dampen the hot grates a little before scrubbing. Just watch out for the steam if you use this method. The omnidirectional bristles make for 360 degrees of cleaning. The 18-inch handle has room for an extra hand near the grates. A five-year guarantee is included. It may rust if not dried properly. The bristles are a little short for some grates. Not as flexible at first, although may soften with use. Bristles are always great for getting all the extra gunk out from the sides of the grates, and this Kona does not seem to disappoint. If you want to take an extra look at the Kona 360°, click here. Sometimes, bristles just aren’t enough, especially if you’re a frequent griller. This is why many enthusiasts opt for a brush and scraper combo. These will usually get the job done as expected, but it’s still important to find one with the right material. That’s why I’ve chosen to include this brush and scraper combo from Grillart. This combination cleaning tool is bristle free and durable. It’s made from hard-wired stainless steel. When taking a look at both the brush and scraper, you’ll notice how wide and thick they are. This enables you to get the greasy gunk off even faster. But they’re still flexible enough to reach in between the grates. Additionally, this cleaning duo is compatible with different types of grills and smokers. It won’t cause damage if you use it properly and follow the manufacturer’s instructions. The next feature to mention is the long handle. It’s 18 inches long and made from durable plastic that won’t melt away. And it will keep your hands a safe distance from the hot grill while you’re cleaning. Grillart recommends that you begin by preheating your grill. Then when it’s warm, use the scraper to remove the first layer. After that, dip the brush side into some water, and proceed to clean the grates. The brush and scraper combo. Thick wires and a wide scraper. If a brush/scraper combo tool is what you’re looking for, I can highly recommend this one from Grillart. It’s lightweight yet durable and will get the job done. Take a closer look at it here. Scrapers are great in many ways. One of the main advantages is the fact that there is zero risk of ending up with wires in your food. That said, sometimes when working with a scraper, you’ll need to put in a bit more effort. So it’s important that the material holds up. The Universal barbeque grill scraper does just that. It’s simple, yet amazing at getting the grates truly clean. 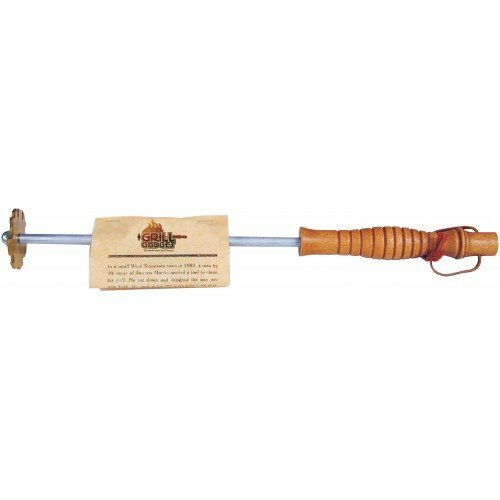 This handy little tool consists of an aircraft grade aluminum shaft with a wooden handle and brass scraper disc. The heavy-duty aluminum shaft is ready for extra pressure when faced with stubborn grease. The scraper has a universal brass head, suitable for a variety of grate racks from the top grill manufacturers. It might take a bit longer to cover everything since it doesn’t have a wide span. But it’s well worth it since you only have to go over it once or twice before the grates are clean. One feature I’m sure you will love is the wooden handle. Combined with the shaft, it measures a generous 16 inches. This helps you to get a better grip when the grease decides to fight back. The scraper itself weighs in at just four ounces, making it lightweight to use. One downside of cleaning your grill is that it can get tiring on the arms. Fortunately, with a lighter tool, you won’t end up with sore biceps. You can easily use it on either a hot or cold grill. Simply glide it across the grates, turn it, and go back, then switch to another grate. Once in a while stop to wipe off any gunk from the scraper. It might take longer to finish the clean. Can scratch the grill if you use too much force. Doesn’t fit as well for some rounded grates. If you don’t mind taking a little longer to finish your cleaning, or putting in a little extra effort, then this is for you. You can take a closer look at it by following the link here. Wooden scrapers may seem outdated, but they remain a very popular tool to have beside your BBQ. 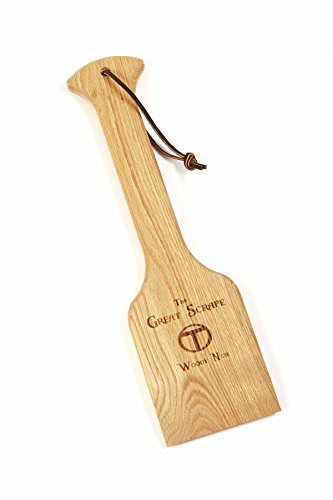 The Woody Paddle grill scraper from The Great Scrape is a hardwood scraper, with a long handle to protect your fingers while cleaning. This one is the longest scraper in the Great Scrape collection, measuring in at 20 inches long. Other lengths and widths are also available. The handle is the perfect length, giving you enough room to place both hands for extra grip. I definitely have to praise the material, which is a blend of solid red oak and beech woods, topped with a coating of all-natural mineral oil. The oil is 100 percent free of toxins and is safe to use around food. This scraper is really a natural and safe alternative for keeping your grill clean. Now don’t let the straight design fool you. As you use it, the scraper will adjust quickly to your grill. The tip is extra thin, speeding up the formation of grooves as soon as you begin to use it. One downside with wooden scrapers is that at some point, you’ll no longer have anything left. Fortunately, the manufacturer has already thought about this. Further up the paddle, you’ll notice that it gets a bit thicker. This is to slow down the groove formation once you’ve gotten that far. To create the grooves, Great Scrape suggests you heat up the grill to get it really hot. Then begin to work in lanes, back and forth. Apply firm pressure, at a slow pace. Repeat this motion several times. Remember to align the grooves each time. Otherwise, you’ll end up with multiple grooves, which won’t work. Long handle helps to get a better grip. The thin tip and thicker top of the paddle starts the formation of grooves quickly and slows down later on. All-natural food safe material and coating. It can be awkward to handle until you get used to the shape. If you’re a frequent griller, it probably won’t last too long. Wooden scrapers are amazing, and the Woody Paddle is no different. Once you’ve created the grooves, it will get all the gunk from your grill without leaving toxic traces behind. To learn more about this product, click here. For those that own an outdoor gas griddle, cleaning bricks are definitely many people’s favorites since they’re easy to use. They will simply wear down into nothing without leaving traces behind. 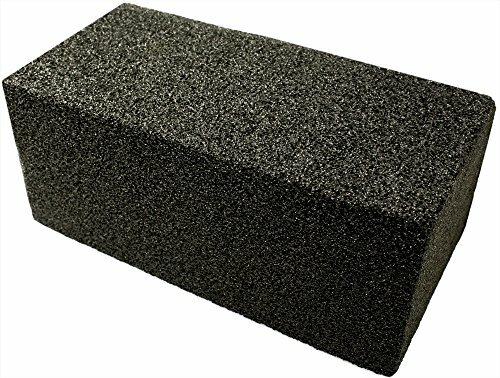 For our top pick in griddle cleaning bricks, we have the Avant Grub. It is extremely straightforward—a black brick, super simple and easy to use. This simplicity is the reason why we love it. The material of the brick is pumice stone, which is a type of volcanic rock formation. It’s extremely lightweight and is full of small pores. This enables it to glide across the griddle, getting at all the grime without too much effort and damage. What’s great about this brick is that you can use it over and over again. This is especially recommended for use on flat-top grills. Another definite plus is that it won’t absorb any grease or odors. This means that it won’t become extremely gross after the second use. You can easily scrape the residue off the brick and leave it in the cabinet until you’re ready to use it again. You can use it on either a hot or cold grill. Avant Grub recommends that you protect your hand by using a brick holder or a cloth when cleaning the hot grill. Simply swipe the brick along the surface, applying light pressure, and avoid scrubbing too rigorously. The material is excellent for efficient cleaning. It won’t absorb odors and grease. Too much pressure can scratch the surface. It can leave a layer of brick dust— a tip is to apply vegetable oil on your grill before using it. If you love simple and easy-to-use tools, then this brick is for you. There’s not much needed to get started — when it’s time to clean, simply grab the brick and start scraping. You can take a closer look here. We’ve all encountered that stubborn grime, which just won’t ease its grip no matter how hard you scrub. Of course, we can always add a layer of harmful chemicals, but chances are that these will transfer to your food. In this case, steam is a great solution. Steam is 100 percent natural and highly efficient, and this is a brush specifically made for steam cleaning. Grill Daddy’s steam cleaning brush is a simple tool and just what you need for persistent gunk. One of the main features of this brush is its bristle-lock technology. No matter how hot and steamy your cleaning session becomes, these bristles will stay out of your food. Grill Daddy locked the bristles with something they call the “bristle configuration lock,” which has been successfully tested, with a pulling force of over 10 pounds. Another extremely useful feature is the removable brush head. When it gets too dirty, remove it and place it in the dishwasher to clean, ready for the next use. Additionally, the material of the brush is FDA-approved plastic that is both safe and very durable. To use it, start by preheating your grill to a medium-high temperature. While it’s heating up, fill the brush with water. When your grill is hot, turn the ON/OFF valve on the brush to ON, and start working your way across the grates. As you use the Grill Daddy, it releases a small amount of water onto the hot grates, which then creates the steam. The steam feature ensures a deep clean. The removable brush is dishwasher safe. Water might leak out, even when in OFF mode. It can scratch the surface if you apply too much force. Steam is a grill enthusiast’s best friend when it comes to deep cleaning, and this brush won’t disappoint. If you want to learn more, follow the link here. Floss is excellent for getting all the grime in between our teeth where the brush can’t reach, so why not try a similar concept for your grill? If you’re looking for something different yet effective, check this one out. Don’t worry, you won’t be using a piece of string to floss the grease away. This tool is made from stainless steel that will last for years to come, even through rigorous cleaning and bad weather. A notable feature is the head of the tool, which can be adjusted to fit four different-sized grates. 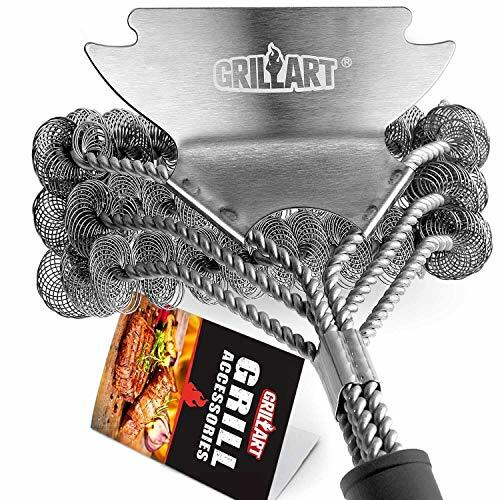 It’s important to mention that this tool only works with rounded grill grates. What’s so good about this scraper is it will get everything off without leaving any bristles behind. It also cleans the surface faster and with less effort than some other tools. Another amazing feature is that you can turn it or angle it, to get all the sides clean. Additionally, the handle is 20 inches long. That makes it ideal for cleaning a hot grill without the risk of burnt fingers. To use the GrillFloss, it’s best to get your grill warmed up first. Then simply match the head of the tool with the size of your grates and start scraping. Now and again turn it to get another side. The adjustable head ensures a deeper clean. It’s easy to handle and turn to the side. The 20-inch long handle keeps your hands safe. Works only with round grates. You may need to use a brush afterward. The head has been reported to loosen or fall off, but customer service will provide a replacement. If you’re looking for the perfect tool for your rounded grill grates, then look no further. The GrillFloss could be exactly what you need. It may require some extra patience at first, but it seems to be well worth it. You can have a closer look at it here. There are plenty of grill cleaning tools around, but here you’ve got a shortlist of the very best available. When choosing a cleaning tool, you need to think about the size and shape of your grate and the effort you’re willing to put into cleaning. You also might want to consider portability. And of course, consider the safety and the durability of the tools you will buy. it’s important that you look for something that won’t leave steel wires in your food. We hope that you found our list helpful. Do you have your own favorite cleaning tool? Please feel free to leave a comment below if you have any recommended tools you use yourself, or any questions on the ones we featured in our list.